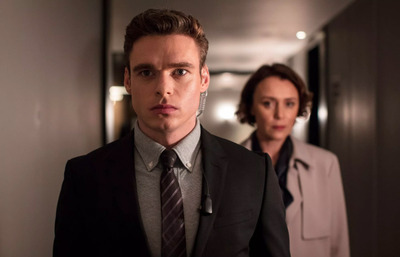 “Bodyguard,” a hit British TV series Netflix is streaming outside of the UK, was viewed by 23 million households in its first four weeks. The show stars “Game of Thrones” actor Richard Madden and has a 94% critics score on Rotten Tomatoes. Netflix added to its impressive catalogue of British TV series in October with “Bodyguard,” a thriller starring “Game of Thrones” alum Richard Madden. And it’s paid off for the streaming giant. “Bodyguard” was viewed by 23 million households in its first four weeks of release, Netflix’s content chief Ted Sarandos said during Thursday’s fourth quarter earnings call. Netflix counts a view for a TV show as an account that watches at least 70% of a single episode. The show won the Golden Globe for best actor in a drama series (Madden) and was also nominated for best drama series. The show originally premiered on the UK’s BBC network in late August and grabbed viewers with its twists and turns. It’s the latest British series to be streamed outside of the UK by Netflix, which regularly works with international production companies to acquire global distribution rights, according to Deadline, which first reported the “Bodyguard” deal in September. Other British shows that Netflix has acquired include cult hit “The Frankenstein Chronicles,” which stars another former “Game of Thrones” actor, Sean Bean; “Collateral,” starring Carey Mulligan; “Wanderlust,” starring Toni Collette; and “The End of the F—ing World,” which Netflix recently renewed for a second season. It’s a strategy that has worked in both Netflix and UK networks’ favour, as Netflix is able to introduce the shows to a wider audience. Some series don’t manage to grab audiences in the UK, but once streamed on Netflix, shows like BBC’s “The Last Kingdom” found success. Its third season debuted November 19.